The Microsoft Access Calendar Scheduling Database is a full-featured calendar system built completely in Microsoft Access tables, forms, reports, and VBA (Visual Basic for Applications) code. Based upon some of the concepts of the Microsoft Outlook Calendar modules, this database template has the advantage of being 100% Microsoft Access based. As a result, this allows for smooth and easy integration into your existing Access database. The Microsoft Access Calendar Scheduling Database offers a daily, weekly, and monthly view of scheduled appointments. This database includes a form for scheduling and maintaining appointments as well. 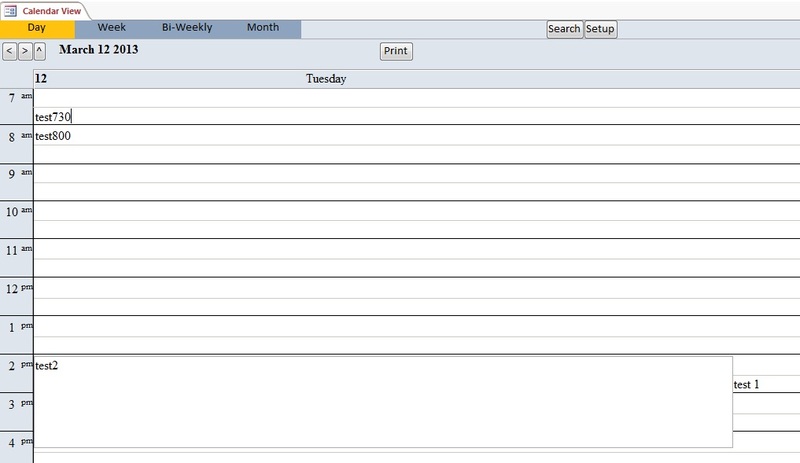 Pre-built daily, weekly, and monthly reports are also included with the Microsoft Access Calendar Scheduling Database. Please note that this is only a template database; if it doesn't meet your needs 100% and you are unable to customize the database yourself, let WSI know and we will provide a quote to develop the customizations you need to get exactly what you want in your calendar system. Are you looking for the ability to use this template with multiple people/items? If so, be sure to check out the Enhanced Microsoft Access Calendar Scheduling Database. This version of the tool allows you to select a person/item to who you will assign the appointment, and then filter the calendar you are viewing to that person/item. Do you just need a basic version of this template? If you answered yes, please check out the Basic Microsoft Access Calendar Scheduling Database. This version of the tool allows you to create a very basic entry in the day, week, bi-week, or month form. If you want the ability to use this template in Excel, then be sure to check out the Microsoft Excel Calendar Scheduling Template. Are you looking for a .NET web-based, mobile-friendly version of this template? Please Contact Us for pricing or to arrange a demonstration. If you are interested in a VB.NET, C#.NET or ASP.NET version of this template, please Contact us for more details. Download a demo version for free to try out. The demo version is in Access 2007 which will work on either Access 2007, 2010, 2013, 2016, 2019 or Office 365. If you need a previous version of Access to tryout, please Contact Us. Please note that the demo version of the software is fully functional, but doesn't store any data once you close the database; the full version of the software, that is available for purchase, stores data in the database permanently. $299.99 for unlimited developer use - this allows you to use this database template however you wish for any applications you develop and distribute. $399.99 for unlimited developer use - this allows you to use this database template however you wish for any applications you develop and distribute.